Geraldine McCaughrean's outstanding book The Kite Rider won The Blue Peter Award, the Smarties Prize Bronze Award, and was shortlisted for the Carnegie Medal when it was published eighteen years ago. With a stunning new cover by the talented illustrator, Melissa Castrillon, this ... read full description below. Haoyou knows that his father's spirit lives among the clouds above Ancient China. He also knows that to save his mother from being forced into a new marriage he must now follow in his father's footsteps and take to the skies, riding a kite through the clouds and the spirits of the dead. Then the Jade Circus offers him a chance to escape his enemies and travel throughout the empire, and maybe even perform before Kublai Khan himself. But is going with the circus really the best option? Could the circus master be leading him into even greater danger? 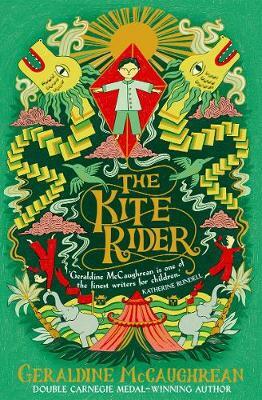 This outstanding story by multi-award-winning author, Geraldine McCaughrean, is being published in this beautiful edition for a new generation of readers.